The Challenges within Clinical Education! In discussions with educators and clinical facilities across the nation back in 2005 (see History & Growth of TCPS to learn more), barriers and challenges related to clinical education from both perspectives were identified. 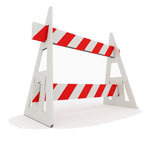 Which of these barriers are your struggling with? Knowledge about available clinical learning opportunities. Too many or too few students at clinical facilities. Time required to secure placements – both in the school and the clinical facility. Double placement of student groups. Lack of placement data in a format that can be used for reporting. Redundant clinical orientation requirements and content. Using a clinical day for facility orientation. Time required for facility or school educators to orient students to assigned facilities. Ability to consistently evaluate clinical placements against learning outcomes. Limited ability to evaluate clinical preceptors. Learning experiences with clinical preceptors. Let Us Know Your Barriers To Education!